Michael Buckley, Philip DeFranco, Kina Grannis and Felipe Neto have chosen to use their Google name as their identity on YouTube, by linking their Google+ profile with their Channel. This has helped them access engagement and social features like Hangouts on Air. 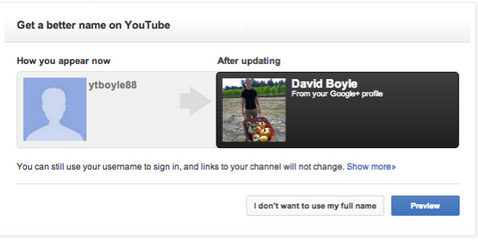 You may have seen a prompt like the one below inviting you to use your Google identity on YouTube. If you haven’t, you can opt in right now using your account settings. If you unify your YouTube identity with Google+, it will be easier for your audience to find and connect with you on YouTube, Google and across the web, and it will help you build your brand across all of Google’s products. We’re also continually developing new engagement features like Hangouts on Air that take advantage of the best that both YouTube and Google+ have to offer. Over the past several months we’ve been giving YouTube users the ability to change how they appear on YouTube, by using their Google+ profile on their YouTube channel. Well-known creators such as Michael Buckley, Philip DeFranco, Kina Grannis and Felipe Neto have chosen to use their Google name as their identity on YouTube, by linking their Google+ profile with their Channel. This has helped them access engagement and social features like Hangouts on Air. It was a huge and long overdue relief when we were allowed to change the identity of our Youtube accounts, because in my case (and I really really really can't be the only one) I created my Youtube account with a business name that I have long since closed. Sadly though, it still lurks (and no doubt confuses visitors) as the username. Isn't there some way you can allow us to change usernames too? Do you not use system-generated numbers as the account key index? Could you connect your channel to more than one Google+ Page? Not for nothing, but... WTF? Is this happening or not?